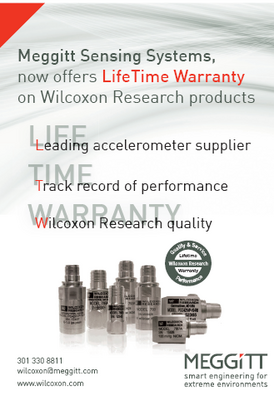 Meggitt Sensing Systems offers LifeTime Warranty on Wilcoxon Research industrial predictive maintenance products including accelerometers, velocity sensors, vibration transmitters & alarms, hazardous area sensors, connectors, vibration shakers etc. Wilcoxon Research is a leading manufacturer of vibration sensors for industrial CBM applications. Wilcoxon’s sensors are essential to PdM programs that save money, reduce downtime, and improve safety. Meggitt offers vibration monitoring products for a wide range of applications, high-quality Wilcoxon Research products backed by lifetime warranty and competitive pricing. Their performance is supported by side-by-side product tests. Meggitt's offering of Wilcoxon Research vibration sensors includes velocity sensors for machinery health monitoring, high and low frequency accelerometers for high- and slow-speed monitoring, high temperature sensors for extreme environments, etc.